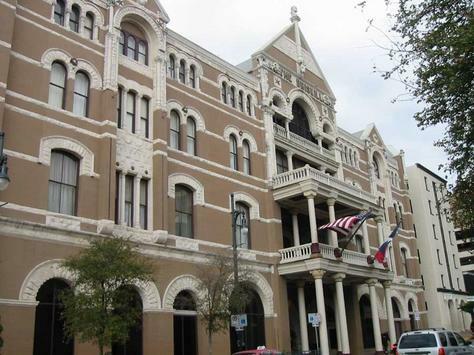 Is Driskill Hotel in Austin haunted? The Driskill Hotel, a Romanesque style building completed in 1886, is the oldest operating hotel in Austin, Texas, USA, and is one of the best-known hotels in Texas. The Driskill was conceived and built by Col. Jesse Driskill, a cattleman who spent his fortune constructing "the finest hotel south of St. Louis"
It is common at the hotel for people to claim that they hear people playing upstairs. They also claim that they feel something touching their face and arms. Some people even say that they see figures in their windows and sitting in chairs. On the 3rd floor of the Hotel in one of the hallways there is a painting of a little girl holding flowers, witnesses report when they looked at the picture a weird sensation came over them. It was like something was lifting up the heels of their feet, a tingling sensation causing their equilibrium to be off for the next few hours. Legend also has it that Col. Jesse Driskill haunts the top floor and elevators of the hotel he built in 1886.